The multicolored exterior brick masonry on a 1920s commercial structure exhibited various patterns of distress. The building is located in an area with extensive rainfall and a mild climate. Deterioration included fine cracks in the face of the brick, some larger ones extending through bricks and mortar joints, and surface erosion of few bricks (especially the red/orange colored-brick), as well as mortar deterioration and evidence of past repointing and other repairs. The exterior brick masonry exhibits surface erosion of the red/orange brick, revealing the unusual internal structure. The mortar is relatively hard and projects above the eroded surface of the adjacent brick units. As viewed from the exterior, individual bricks had a pattern found on past projects to be characteristic of uneven firing, with the center of the brick surface distinguished in color from the perimeter. Individual brick samples were removed at an inspection opening location to expose the underlying construction. The interior face of a brick cut lengthwise before it was originally installed in the wall revealed distinctive striations similar to a flow pattern. When viewed at the end of the brick, a swirled pattern was evident. To understand the reasons for the pattern observed at the interior of the brick, petrographic studies were conducted. Sawn and thin sections of selected brick were prepared and viewed under microscopes, confirming incomplete mixing likely occurred during fabrication. The thin orange-red and gray layers are consistent with use of raw materials from two sources that did not have the same chemical composition; the red color suggests the presence of iron oxide (Fe2O3) and the gray color is consistent with less iron and possibly more calcium carbonate (CaCO3). The brick is also highly porous, exhibiting some interconnected macro-pores (compaction voids), helping to explain the erosion observed in individual unitsl. Other bricks in the same assembly, characterized by different colors and lacking the odd internal texture, did not exhibit the surface erosion seen in the highly porous red/orange brick. 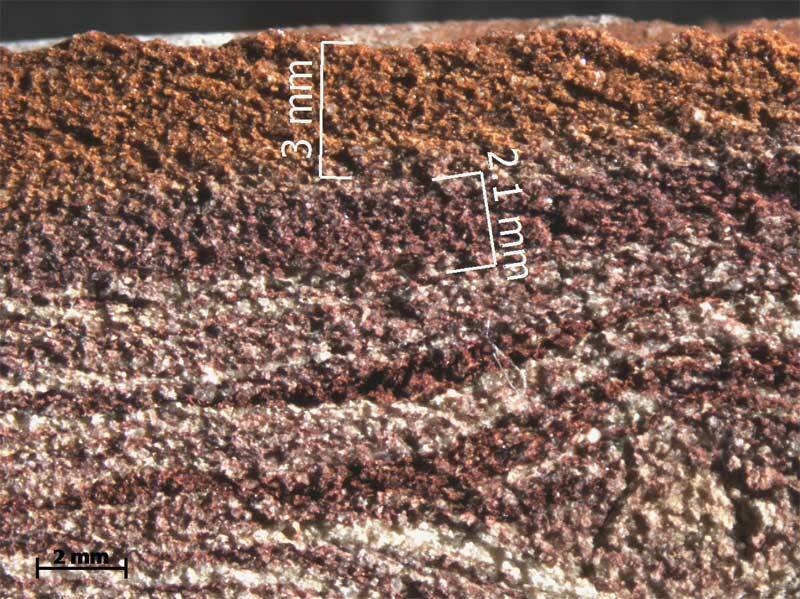 Photomicrograph of sawn section of brick showing distinctive layers of different materials and angular sand particles included in the brick as filler. Although the building is located in a mild climate and has survived for nearly 100 years, continued serviceability of the subject brick is questionable, given ongoing deterioration. 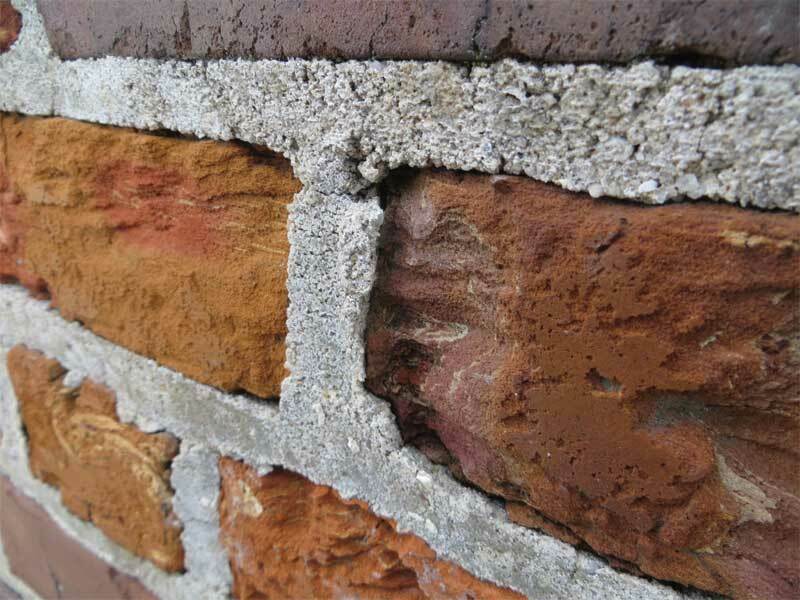 Petrographic examination confirmed fabrication deficiencies are likely contributing to surface erosion of the brick. Hugh (Xiaoqiang) Hou, PhD, and L. Brad Shotwell of Wiss, Janney, Elstner Associates (WJE) contributed to this article.